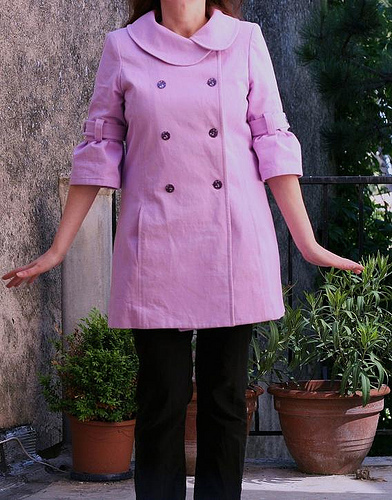 I wanted a spring jacket and just felt in love with the view B of the McCall’s 5525 trench coat pattern ! 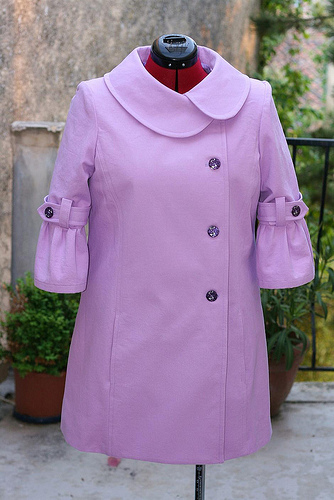 I find that the bell sleeves and Peter Pan collar give it a perfect look for spring… and I love princess seams. 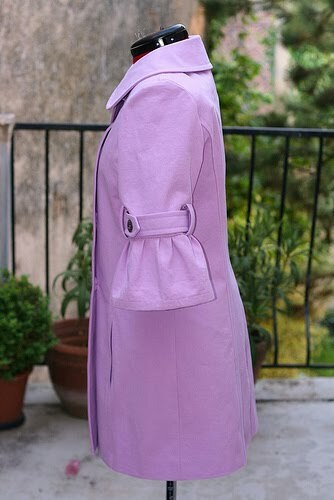 The added bonus is that the other views which are more “classic trench coat” style make this pattern a keeper ! Semi-fitted, lined, double-breasted jacket and coat have collar, lengths and sleeve variations, shoulder pads, princess seams and side front pockets. 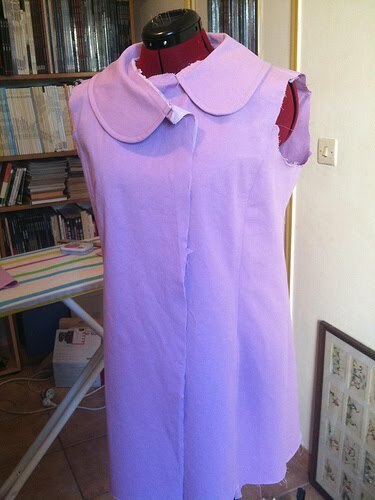 I made view B with bell sleeves and Peter Pan collar. Pretty much, though as a beginner I would have liked some more construction technique tips. Hopefully with Pattern Review every technique tip or help is only a click of the mouse away. – Clip the convex piece every half inch or so, up to the staystitch line. In this pattern the convex pieces are the front and back pieces. The concave pieces are the side-front and side-back pieces. – Now you can easily adjust the convex (front or back) piece shape to the concave (side-front or side-back) shape. Pin, matching the staystitch lines as a guide. – Sew with the concave (side-front or side-back) on the feed dogs. – Finally don’t iron it flat ! I don’t have a tailor’s ham so I used the round edge of my ironing board and towels. For the ruffles on sleeves I used the easy gathers tip with dental floss. It worked great, so much better than using the instructions on the pattern (which I tried first). My gathered sleeves don’t look as good as I’d like, It’s all my fault of course, I didn’t take enough care while sewing the ruffled lower sleeves to the top sleeves… But I can be lazy sometime and I didn’t want to redo them. Topstitching ! Now that was very scary for me, having never done it before. I picked a thread color that blended really well with the fabric. I figured that hopefully if I didn’t do it well enough it wouldn’t show too much. The thread was not intended for topstitching so it’s probably not really adequate and too light weight, but I didn’t find a similar color in more heavy weight threads. I sewed as slow as possible, considering my temperamental pedal (I swear this thing has a mind of its own) and used the edge of the foot as a guide. And much to my surprise it went pretty easily. Topstitching the collar was especially scary but slow and steady won the race. 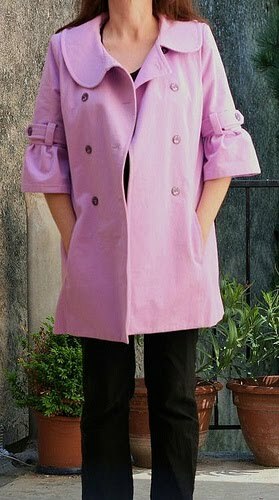 I though view B was a perfect style for a spring jacket with the ruffled sleeves and Peter Pan collar. I love princess seams coats. And the other variations make this a great buy. 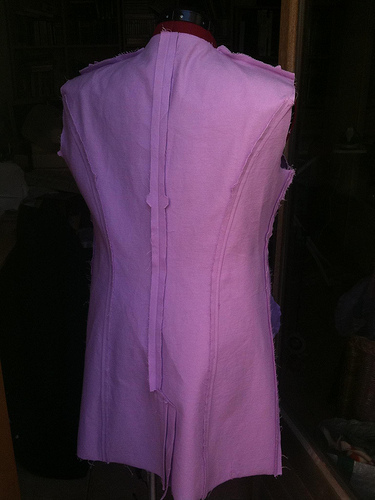 Cotton gabardine, kind of lilac. I ordered it online, and when it arrived it was pinker that what I expected. I wanted something a little more blueish. For the lining I intend to use a cotton print from Alexander Henry (regency skull). But after laying the pattern pieces on the fabric, just before cutting, I realized that with the princess seams I wouldn’t be able to have at least one repeat on a pattern piece. 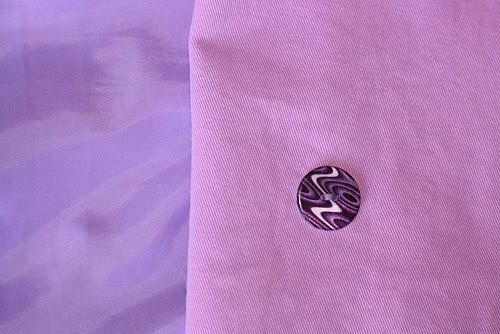 So I decided to save my pretty fabric for another project and I used some “regular” lavender lining I had in my small stash. -After reading the reviews here I cut the pockets bigger.. but not enough, they are still on the small side ! If I was to redo it I would cut it a good inch bigger. -I used fusible interfacing instead of sew in. 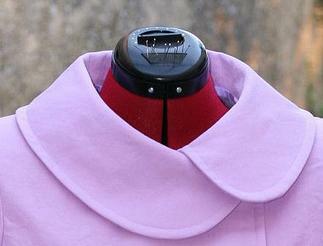 -I interfaced both collar pieces. It wasn’t really a choice, I fused the wrong collar piece first ! -I tried with only one row of buttons (picture bellow) but in the end I added the second row, it looked better to me this way. -I’ve not done it yet but I plan to hand stitched the sleeves bands to the loops to keep them in place. I would not sew this view again, only because the design is very distinctive and one is enough in my wardrobe. I might try the other views someday. I would definitely recommend this pattern to others. I have been sewing for a few months (8ish) this is my 2nd coat and I have to say that I enjoy sewing jacket/coats the most. I find that this is really rewarding and not that difficult when taken one step at a time. Of course my end result is not perfect it has it definite flaws but it’s unique and I like it, that’s plenty for me ! 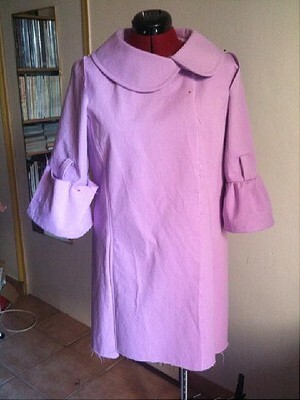 This entry was posted in Blog, Clothes, Sewing Projects and tagged McCall's by Véro. Bookmark the permalink.